Conjure Buns, is an interactive performance, installation and meditation, facilitated through the shared ritual of breaking bread. The work reflects upon food, specifically bread, as a medium of shared experience and contemplation. Conjure Buns is a whimsical experiment in connection, utilizing bread-based head-wear as conduit for telepathic communication. 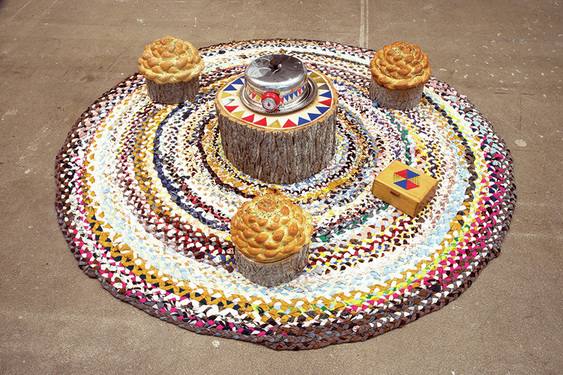 The piece is comprised of a round, braided, rag-rug, approximately 6 feet in diameter. Three short tree stumps are positioned at equal intervals around the perimeter of the rug. On top of each stump is a round bread-hat made of braided challah bread. In the center of the rug is a larger stump, which serves as a table. On top of the central stump is a metal baking dome covering twelve freshly baked buns. The buns are baked in three parts, as to be easily broken and shared between three. The piece was exhibited in 2016 at the Dunlop Art Gallery, in Regina SK - as part of the exhibition, On the Table. During the gallery opening, a limited number of visitors participated in the piece. Participants sat for five-minute, silent, meditation sessions on the rug, while wearing a bread hat, with the artist. Before beginning, participants were introduced to the piece and prompted to focus on one colour (blue, red, silver or gold) throughout seated session. Participants sat with their hands resting on a metal baking dome, housing freshly baked buns. At the end of each session a bell was rung and participants will removed their hands from the dome. The cover was lifted and one bun chosen to be consumed. Before " breaking bread" participants marked which colour they had been focusing on, with a triangular marker on the log table in front of them. The degree of telepathic and psychic connectivity was observed by the correspondence of colour choices. Records of these choices were made on the log table and, once complete, formed a circular pattern, and marker of performative events.